The installation-based work of Svava Thordis Juliusson also speaks eloquently to the peculiar aspects of this unconventional exhibition venue. Using plastic cable ties and safety fencing to create her sculptures, materials that imply restoration and construction, Juliusson’s work seems a perfect complement to the dilapidated conditions of the space in which they are exhibited. And yet the twisted, contorted, somewhat amorphous shapes that belong to these sculptures speak of their own disorder and likely inability to act as any sort of mending influence. Juliusson’s process, like that of Kernohan, is highly intuitive and it is these unorthodox materials that seem to somehow guide the artist’s hand and imagination. The work could be described as spiky, alien-like creatures, or even land formations not of this world. The fact that these sculptures are able to reference, albeit subtly, something oddly anthropomorphic and vaguely related to the natural world is a significant surprise, given the “artificiality” of these materials and their colours. When looking at these sculptures one feels that notions of the “natural” and the “artificial”, along with their contentious relationship to one another, are being called into question; this work seems to understand well that the lines between these concepts are now forever blurred. 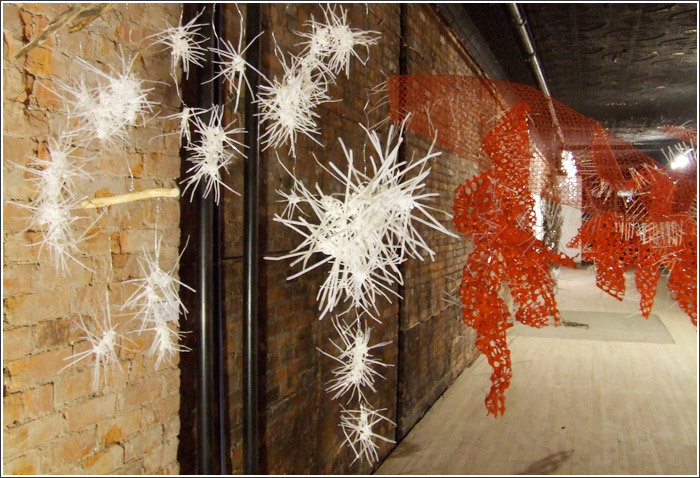 Sculptures such as Hrisla (and the) ceaseless commerce with earth and air (2010) and Hreyfi (2010) go so far as to incorporate a wild tangle of plastic ties and Norwegian Maple roots, which Juliusson came across while digging in her backyard. Juliusson’s work buzzes with a frenetic energy. Her sculpture quivers like uncoiled quills on end. As one walks before and around it, it is with a sense of caution, even concern, that those very quills might strike us. This sense of unease might cause the viewer to question the meaning of beauty and aesthetics, and yet there is something undeniably beautiful about this work. The cable ties in particular seem to twinkle as they reflect light, electrified in a manner that seems to imbue the work with a quasi-spiritual presence. 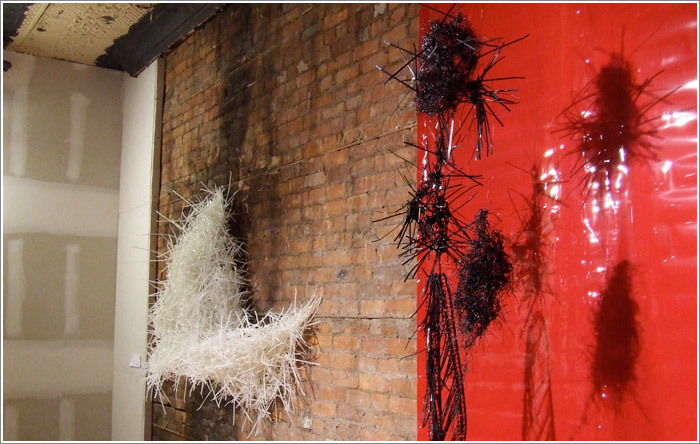 Pieces like Svona (2008) and Svona II (2009) resemble birds or perhaps angelic figures, divine creatures that border on the ethereal. Rarely are materials that are so common transformed in such a manner as to cause us to reevaluate our very notion of the banal. When that which is most ordinary becomes the site of transcendental possibility, we are in the presence of that which is most redeeming about creative expression, a creativity which allows us to see the possibility of accepting, and perhaps even loving that which is seemingly most plain and ordinary about ourselves, our lives, and our world.